Slip, Trip & Fall Accidents Attorney | New York & New Jersey | Law Offices of Adam M. Thompson, P.C. Slip, trip and fall injuries occur when someone loses their footing or balance or stumbles or falls due to the presence of a foreign object, a slippery substance, and/or a dangerous condition. These accidents can be very serious and cause severe personal injuries and damages to victims. In fact, unintentional injuries, like those caused by slip, trip and fall accidents, accounted for the death of nearly 98,000 Americans in 2001. Over 14,000 deaths were caused by falls alone. Senior citizens are especially vulnerable to these types of injuries; approximately one in every three people over the age of 65 suffers a fall each year. Fractures are the most common result of these unintentional injuries, which can lead to surgery and extensive physical rehabilitation. Seniors have an increased likelihood of suffering more severe injuries, like hip fractures, which can lead to extended hospitalization and loss of independence. It is also important to remember that falls are a leading cause of traumatic brain injuries. What Should I Do If I Have Been In a Slip and Fall or Trip and Fall Accident? Click here for more information. 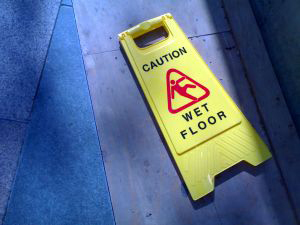 Slip, trip and fall accidents can be caused by an almost limitless variety of circumstances. In an urban environment, like New York City, one can have an accident as a result of snow or ice, poor lighting, abrupt changes in flooring levels or even potholes and cracks on the ground. If your accident occurs because of a negligent condition, you may be able to pursue a claim against the property owner or tenant to recover damages for your injuries. You can also pursue a claim for damages against a state, county, city or other public entity if your accident occurs on government-owned property, such as a sidewalk or subway station. Even if you believe that your actions partially contributed to your accident, it may be possible to receive compensation for the damages you suffered. There are many legal hurdles to overcome when pursuing a claim for damages in a slip, trip and fall case. It must be demonstrated that the property owner or tenant was aware of the dangerous condition on his/her property and failed to take reasonable action to correct it. Evidence of a dangerous condition can be difficult to obtain. In addition, the time limits for pursuing legal action may be extremely short in certain cases, such as against the City or State. The Law Offices of Adam M. Thompson, P.C., is a New York City personal injury law firm that fully understands the many difficulties facing a person injured in a slip, trip and fall accident. Our slip and fall accidents attorneys have handled numerous types of these cases and have a thorough understanding of the state and federal laws applicable to personal injuries and damages resulting from such incidents. We have the resources to properly investigate the facts and circumstances of your accident and demonstrate the fault of the responsible party. These measures include obtaining statements from the parties at fault before they have a chance to speak with their insurance company or lawyer and recording eyewitness accounts while the event is recent. In certain cases, engineers or other experts will examine the accident site to determine if violations exist. We will gather the necessary evidence to demonstrate wrongdoing, including police reports and hospital records. In addition, we have access to a variety of medical experts to help document and present the serious impact your injuries will have on your quality of life. We will fight to protect your legal rights and ensure that you continue to receive the medical care and treatment you need while your case progresses. The Law Offices of Adam M. Thompson, P.C., has seasoned trial lawyers who have handled and tried all types of slip, trip and fall cases and know what has to be done to win. Not only do we understand how to best present the facts of our client's case to win, but we fully understand and are familiar with the defense's tactics and techniques and know how best to combat them. Our years of trial experience and background puts us in the best position to maximize your likelihood of success and recovery. Though a favorable verdict and monetary reward cannot bring you back to health or prevent your injury, it can help maintain your quality of life and ensure that the responsible parties are held accountable for their negligence. If you have been injured in a slip, trip, or fall accident, start seeking justice today. Call the Law Offices of Adam M. Thompson, P.C. at 855-497-2326 now, or send us a message via our contact form, to find what we can do for you. We proudly serve clients throughout New York State and New Jersey.